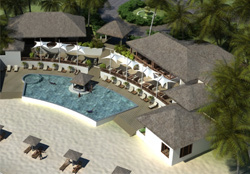 Guinjata Bay hotels, accommodation and places to stay. Guide to where to visit and where to stay in Guinjata Bay Mozambique. 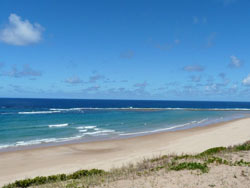 Guinjata Bay is by Jangamo beach just a short distance from Inhambane Mozambique. Access to the Guinjata Bay, Jangamo beach, Paindane beach and Coconut Bay area is by 4 wheel drive only as the road down to the lodges on Jangamo beach, Coconut Bay and Paindane beach around Guinjata Bay is a sandy track with some patches of soft sand down towards the lodges, such as Guinjata lodge, Jangamo beach lodge, Jeffs, Paindane Lighthouse and Coconut Bay lodge. Jangamo Beach is a great example of a Mozambique beach with the sparkling Guinjata bay offering excellent water activities. Information on Guinjata Bay Mozambique, location of hotels, lodges, camp sites, guest houses, bed and breakfasts and places to stay in the Guinjata Bay area of Mozambique. Distances from major attractions to Guinjata Bay and information about shops, fuel and facilities. 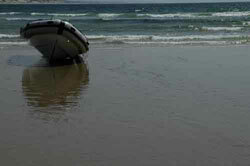 Holiday resorts in the Guinjata Bay area all require a 4x4 to get there. In most cases transfers can be arranged from Inhambane to Guinjata Bay for fly-in visitors to Mozambique or for those self-drive visitors to Guinjata who do not have a 4x4. Set among swaying coconut palm trees close to an unspoilt beach, Coconut Bay is paradise. 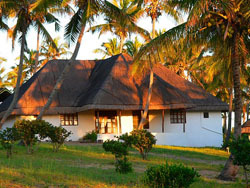 Founded in 1993 the bush land has gradually been converted into the comfortable holiday resort of Coconut Bay. 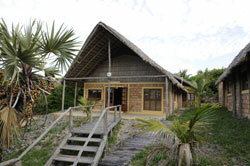 Pescador lodge is an exclusive private lodge in Guinjata Bay. The chalets are brick built with raised ironwood decks connecting every room with the central kitchen unit and main deck. 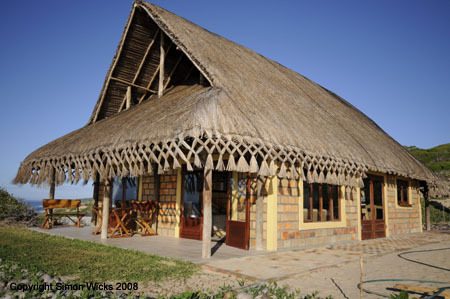 The lodge is built on a dune which gives you an exceptional 180° sea view and 300meters from the beach. 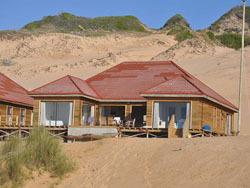 Casa Junkie is situated around the edge of a naturally formed ox-bow shaped depression just behind the primary dune offering direct, private access down to Paindane beach below. A tropical getaway and luxury beach lodge in every way for all the family. Situated only 100m from the sea with a spectacular view and reef, each house comprises of 4 bedrooms, 3 bathrooms and a large open plan kitchen, dining room and lounge which has folding glass doors opening onto a deck and plunge pool which overlooks the sea. 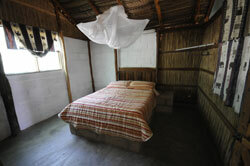 Each house has been tastefully furnished and comes fully equipped, including linen. 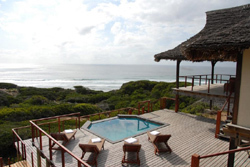 Welcome Island Rock Resort - Mozambique, nestled in coastal forest, high up in the dunes, Island Rock Resort is unequivocally set on the picturesque coast of tropical Mozambique. 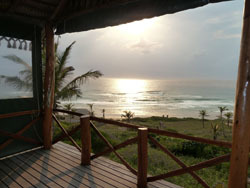 Paindane (Praia de Paindane) is situated 28 km South of Inhambane and is nestled amongst plantations of Coconut palms and miles of sun-bleached beaches. 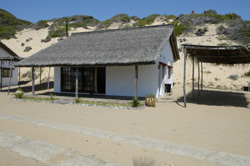 The self catering basic rustic chalets and campsites on the dunes are a stones throw from the beach. On selected campsites baraccas are available for hire. 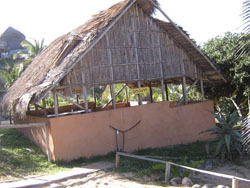 The baraccas are cool traditional shelters with modern clean ablutions and electrical plug points as well as water. 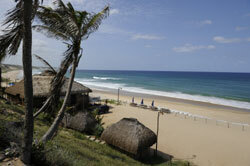 We are delighted to welcome you to our beach in Mozambique. At Oyster Bay Estate we offer you a restaurant, bar, swimming pool, DSTV and the most comfortable self catering in Mozambique as well as many other facilities for our guests and investors to enjoy whilst absorbing the spectacular views and gardens. 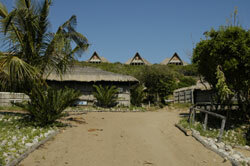 Oyster Bay Estate development is the ideal choice for your travel in Mozambique. 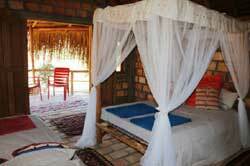 It is well established and fully compliant with the Mozambique Authorities. A modern Mozambican style villa with cabanas nestled below tropical coconut palms and indigenous flora overlooking the ocean. 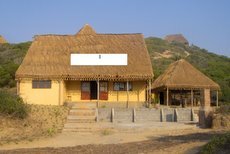 The lodge is situated on a tranquil setting away from the maddening crowds. It is also within easy access to all amenities including shops, restaurants, diving and fishing facilities. 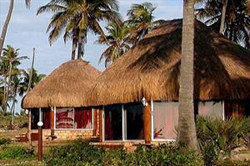 This stylish and unique lodge can accommodate 12 to 16 people with 2 family villa rooms and 2 separate family cabanas set within a huge entertainment and recreational open complex overlooking palm trees, dunes and the ocean. 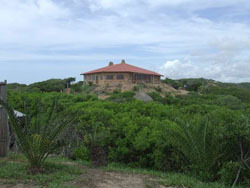 Guinjane Lodge, a luxurious self catering lodge situated at the beautiful white beaches and clear blue sea of Guinjata Bay, 30km South of Inhambane, Mozambique. 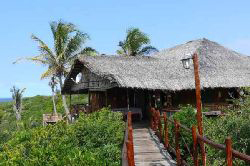 Guinjane Lodge in known as the Jewel of Inhambane due to its excellent beach location,superior accommodation and warm Mozambique hospitality. Selfcatering Cabana (sleeps 4): Low Season: R 660 per night, High Season: R 855 per night, Peak Season: R 910 per night., Selfcatering Casa (sleeps 8): Low Season: R1675 per night, High Season: R2150 per night, Peak Season: R2475 per night., Barraca (camping): Low Season:R200 plus R65 per person, High Season: R240 plus R75 per person, Peak Season: R300 plus R90 per person. 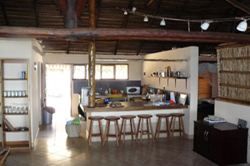 One of the best kept secrets in Mozambique, Accommodation at Dongane consist of self catering chalets with either 2, 3 or 4 bedrooms, a bathroom and kitchen. A generator supplies electricity from 07:00 to 12:00 and again from 17:00 to 22:00. The area features flourishing coral reefs with unique opportunities for diving, fishing, scuba, and snorkeling enthusiasts. Dongane Price Guide : 4 BED R600.00 per day High Season R150.00P.P.D Low Season 6 BED 1400.00 per day High Season R150.00 P.P.D Low Season 8 BED R1650.00 per day High Season R150.00 P.P.D. A R250.00 NON-REFUNDABLE CHALET LEVY IS CHARGED ON CHALETS. Indulgent luxury. Superior quality. Unrivalled style. Welcome to the new standard in luxury coastal living. 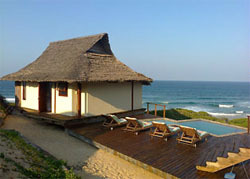 Vista Bonita is a beautiful resort situated between Guinjata Bay and Paindane in the Inhambane district of Mozambique. Spectacular views and peaceful bliss is our trademark. Welcome to Dumela Luxury family villa. A trip on a traditional dhow from Inhambane to Maxixe return. are available from on Mondays, Wednesdays and Fridays. 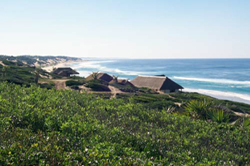 Airport transfers from Inhambane to the Guinjata Bay resorts can be arranged. The last 30km to Guinjata is on a sand road and a 4x4 or high clearance vehicle with a diff lock is required. You can hire a vehicle in South Africa or Maputo.